Your contributions enable us to achieve our mission of investing in innovative hepatology research and in the people who study and treat liver disease. * The AASLD Foundation is tax-exempt under §501(c)(3) of the Internal Revenue Code. Contributions made to the AASLD Foundation are charitable contributions deductible to the extent permitted by §170 of the Internal Revenue Code. The Tax Cuts and Jobs Act of 2017 may affect your ability to deduct charitable contributions as itemized deductions in 2018 and subsequent years. We recommend you consult your tax advisor for details. @AASLDFoundation $ 47M Fund more than $47 million (and growing) in research awards* *Since 2000 Your support is critical. Thanks to hundreds of donors, this year the Foundation funded $4.06 million in 36 Research and Career Development Awards, the largest level of funding in the history of the organization. Even with the Foundation's impressive growth and investment, meritorious research projects continue to go unfunded each year due to a multimillion-dollar funding gap. Further, we continue to see the competition for NIH liver research funding rise, which blocks innovative research and young hepatologists from pivotal funding opportunities. Your donation is an investment in liver research, education and training for clinicians, career opportunities for young investigators and increased access to trained providers for patients. Support hundreds of early career investigators' participation in The Liver Meeting® through travel and abstract awards. Expand our awards portfolio to include the Bridge Award and Pilot Research Award Make a gift at aasldfnd.org/donate today! AASLD Foundation, building upon the philanthropic legacy of AASLD, is the largest private supporter of liver disease research in the United States with more than $47 million awarded since 2000. 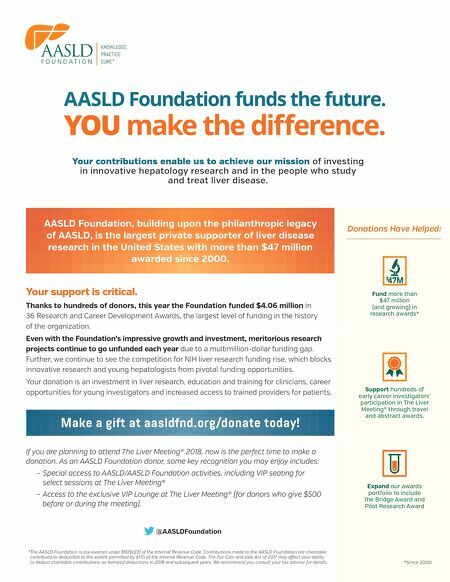 Donations Have Helped: AASLD Foundation funds the future. YOU make the difference. If you are planning to attend The Liver Meeting® 2018, now is the perfect time to make a donation. As an AASLD Foundation donor, some key recognition you may enjoy includes: – Special access to AASLD/AASLD Foundation activities, including VIP seating for select sessions at The Liver Meeting® – Access to the exclusive VIP Lounge at The Liver Meeting® (for donors who give $500 before or during the meeting).